You don’t want to wait years for a beautiful smile. We don’t believe you should have to wait that long, and that’s why we offer Six Month Smiles. If you haven’t heard of the system before, it’s time that you got an overview of what it entails so you will have a better idea of whether it is right for you. You should also take the time to speak with your dentist in Woodridge about the system. This is a system for braces, and it is a relatively simple and fast way for people to correct some issues with their teeth. They have a number of advantages for the patients, namely the cost. They are a cheaper option than traditional metal braces, and they work very quickly. Just as you would imagine from the name, the Six Month Smiles system is supposed to work in six months. They will not cause any damage to your gums or your teeth, but they will move them into proper alignment. One of the other advantages is that these are clear braces. This means you do not have to worry about the unappealing aesthetic of metal braces. The system will work well for anyone who is 15 years old or older. If you have misaligned teeth, it is one of the best and simplest options for getting them fixed quickly and easily. 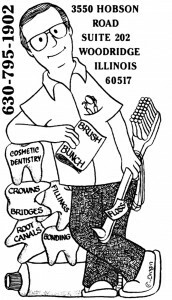 You can talk with your Woodridge dentists about the option. To learn more about this orthodontics option, you can contact your dentist in Woodridge. We can let you know more about the system and how it works. Just call us at 630-795-1902, or visit our contact page. We will let you know everything you need to understand about Six Month Smiles so you can determine whether it is right for you.